Hey New Kids, Buck from RedLynx here with a brand new card showcase! Today we’re going to be taking a look at Blood Elf Bebe. Fantasy players can rejoice, as the first brand new card for that theme has just been released! By now, we all have a good idea of how Bebe works in general. She takes out a unit, and a positive effect for her or her team happens. Robo Bebe gets faster, Medusa transforms enemies, and Buccaneer gets more attack power. Blood Elf Bebe follows the same pattern. With each knock-out, she heals herself and adds to her total health. She’s an interesting card for sure, as the longer she’s alive, the more dangerous she becomes. While this is true for all Bebe cards, Blood Elf also becomes harder to defeat, as her health continues to grow with each successive take-down. While Robo Bebe and Blood Elf Bebe are both 3-cost common cards, it’s difficult to directly compare them, as their abilities are vastly different. Blood Elf Bebe excels in the same fashion as other Bebe cards. Her main strength is in dealing with low health enemies and swarm units, as those units will ‘feed’ her and make her much stronger and more difficult to defeat. There are several units that you can pair Blood Elf Bebe with to increase her overall strength and usability. First off, you want to protect her, so it’s a good idea to have a tank in front of her to soak up some damage. Now, that’s less of a combination and more of a ‘general rule of thumb’ with ranged units. The first combination I’d recommend with Blood Elf Bebe is Robin Tweek. Robin Tweek is going to vastly boost Blood Elf Bebe’s health. This will allow her to stick around longer, and of course synergizes with her own ability. While this combo is good, I wouldn’t call it great. Giving her more health is nice, but doesn’t necessarily make it a killer combination. If you really want to increase her overall ability to cause the most amount of trouble for your opponent, pairing her with one of the Kyle cards is a good idea. In my testing, I’ve found that Bounty Hunter Kyle pairs REALLY well, as he gives a pretty good boost to attack (depending on how long he stays alive) but he will also heal all units when he defeats an enemy unit. The other potential pairing for Blood Elf Bebe is Regeneration, and the recently buffed Hallelujah. Blood Elf Bebe gets strong as she takes out units, keeping herself healed and increasing her max health, but, if she isn’t getting that final hit for a kill, the only other option is to run Mystical alongside her and keep her going with the many healing options that Mystical has. Tanks. If it can be avoided, try to keep all Bebe cards away from tanks. If you end up locking onto a tank, that will leave you exposed to any number of attackers. It’ll also make it very difficult for you to trigger her power. If you’re looking to pair Blood Elf Bebe with one of the combinations listed above, or maybe one that you came up with yourself, try to have a back-up plan. Just in case you don’t get the first combo, you have another one ready, or you have another strategy all together. You know what they say, “Don’t put all your eggs in one basket”. I feel that Blood Elf Bebe has some really good potential and I’m glad that Fantasy is finally getting a new unit! 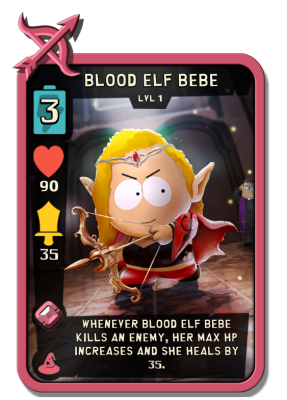 Sci-Fi users may prefer to use Robo Bebe, as she has more damage dealing potential, but Blood Elf Bebe is a great anti-swarm unit. She can also cause your opponent to think twice about laying down that Rat Swarm card. With the right combos, she can be a pesky unit to deal with and I’m ready to see what sort of strategies all of you come up with! 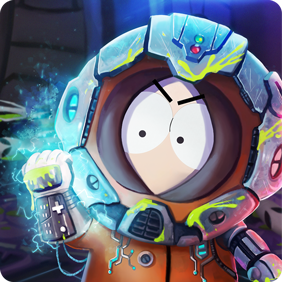 Until next time, I’ll see you on the streets of South Park!